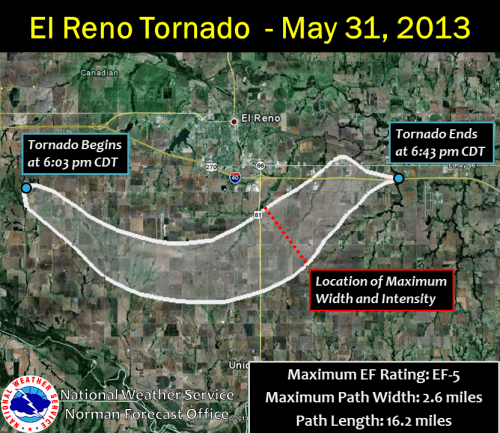 The El Reno/chase is something that will forever haunt me, and for so many different reasons. On this 2 year anniversary, I want to talk a bit about that day, the chase and the days that followed. I departed with Brett and we headed southwest to Chickasha, OK. We both knew the day had the potential for significant tornadoes, but it was close to home, which scared us. While there we had our typical fiasco about which target… North or south.. Brett said north, which ended up being the right call (well, at least in terms of getting a storm), so we went north. By about 5PM, we had no storm yet… We knew that with all this time to build up, the atmosphere was about to release an unimaginable amount of terror. We got on the storm and watched it for a while, SW of El Reno. Some were reporting a tornado in the rain, but we couldn’t see a thing. We waited and decided to venture north, a bit closer. As we were driving north the first tornado appeared.. For a brief bit, another tornado appeared. As we get closer and finally stop, due east of the circulations, “tornadoes” keep spinning up everywhere to our west… I use “” because the whole sky was basically the tornado. This was the beginning of the killer, 2+ mile wide tornado. Well, you all really know this story. The video has been everywhere. Global news, documentaries, newspapers, critic YouTube Videos, constant re runs on The Weather Channel… But just in case, here it is.. But before you watch it, let me clarify a few things. Yeah, I am screaming my fool head off.. Why? Because for the first time in my life I had a legititmate fear that my life was about to end. I was looking at my window and seeing death come right toward me. I had intense feelings of guilt, that I may leave my family.. That I took too long filming and might take away Brett and Gary from their families. I wanted out. I wanted to escape. I wanted to shut my eyes and never open them. If Brett could have looked out the window I am sure he would be mortified as well. I just have to say all that for those who think I was some drama queen. Like I wanted to be screaming and feeling that way. After the tornado. I saw my car.. Destroyed… I work with a very reputable video broker, I knew I had dramatic video, and I knew when people hear my name, they look at the video. That’s not meant to sound pompous, but it’s the fruit of years of good video. When I saw my car destroyed, I knew I needed money to fix it. I was in college, and not much more needs to be said. I knew selling my video would bring me a good chunk of change, so I did. I didn’t think in the moment about the consequences that would follow. That video went viral. I cannot count how many calls I did, phone interviews, news interviews. We were picked up in a limo at 5am for interviews with ABC, NBC, FOX, etc. It was global too, Chinese TV, Canadian TV, radio stations over the world. Everyone wanted to talk to me. I went 2 days literally of no sleep, trying to answer to all the attention. There were people upset about my video, I soon realized. Some professionals that I really looked up to in NWS/SPC in Norman really were dissapointed in me, and that really hurt me. People I worked to earn the respect of for years, only to lose in my few days of fame. Others thought the movie was insane, awesome, etc, but nothing could stop the wear on me that I got from professionals. Being a student intern at NWS Norman, I was really ashamed of all the negative attention I brought. Beyond that, I was wearing a Storm Prediction Center shirt, which upset some of my peers there. To this day, I still am ashamed of any negative attention I brought them and how poorly I “represented” them, since I was affiliated, even though loosely, with them. This “media” is actually what took me away from going into government weather… I wasn’t going to stop chasing, but I clearly could see this resentment or look of disapproval from so many people in the movement sector. I knew I wasn’t going to stop chasing, so I decided to go on my own path in life. There were other factors too, which I have wrote about before. I honestly don’t remember how exactly the night went down when I found out about Tim, Paul and Carl. I saw some rumblings on Facebook and when I finally saw the confirmed source, I lost it. I called a lot of people.. It’s not like I wanted to deliver that news, but I wanted to tell someone.. I didn’t want to be alone in knowing. Some people I called were silent, some just mumbled, some cried. Amidst all the sadness, confusion and other emotions, I somehow felt my feelings of guilt, slip away… The passing of Twistex, though incredibly tragic, finally put this storm into perspective for so many people. This storm was an incredible beast. It killed the safest and most experienced chasers out there. For days I pleaded with people to understand I wasn’t trying to be a daredevil, I was just in awe of nature and lost track of things. I think this put it into perspective… So many other close call stories over the coming weeks would continue to do so. This news did do one thing immediately though. It stopped the news interviews. I wasn’t going to sit there and be in the spotlight for an event that ended the lives of my dear friends. Not that they would want the “attention” but I knew that at this moment, it wasn’t right for me to be in the light, and that all attention should be turned onto healing, recovering and honoring the Twistex team. This tornado revamped the fear of nature in me, that brought me into chasing in the first place. To this day I have never, and will never get as close as I let myself get that day. I will never have another near death tornado experience. No shot is worth that. No shot is worth leaving behind a family for. No shot is worth putting someone else in danger. I am sorry for what I did and have made clear strides into not letting something like it ever happen again. First and foremost on this anniversary, I remember the Twistex team and mourn their loss. I learned a lot, I changed the way I chase. I realize the value of “the shot” is never great enough to risk peril. I learned that mother nature is the unforgiving force and in all her fascination and glory, can be a killer. I was filled with a rush of renewed desire to learn more about tornadoes and further my career in meteorology. RIP Twistex.. Until we meet again. Brandon, I have never met you personally. But have been following you for since that unfortunate event. You can’t change what happened…its history. But it seems to me you have matured a great deal in the few years. That’s just part of growing up. Trust me…if someone else your age who was a student got footage like that…they might have done the same thing. Don’t beat yourself up. Sounds like you are doing quite well and have plenty of respect from your peers now. Thanks Curt. Means a lot. I worked hard to gain respect from respected people like yourself! I am glad it’s apparent that I have learned from the experience! I remember seeing your video not long after those storms. I am so glad you and your team made it though that okay. Your video and the loss of the Twistex team are reminders of how dangerous it is for the chasers. I sit and watch from a safe distance through the websites and I often see teams warning people when there are no sirens. I am sure many owe their lives to you and people like you.